Manny Acosta pitched two scoreless innings last night and struck out five of the seven batters he faced. After giving up 9 ER in his first 7.1 IP with the Mets this year, Acosta has allowed just 4 ER in his last 27.2 IP. He has a 1.30 ERA in that stretch with 7 BB and 31 Ks. Manager Terry Collins has finally allowed Acosta to pitch more meaningful innings but that seemingly has more to do with the implosion of other relievers than the success Acosta has achieved. The Mets continue to give Bobby Parnell every chance to be a successful late-inning reliever despite a track record no better than Acosta’s. Parnell was gifted the eighth-inning role out of Spring Training this year while Acosta was exposed to waivers. Both pitched well in 2010 for the Mets but Acosta had a 1.69 ERA and a 1.03 WHIP in ST while Parnell had a 4.09 ERA and a 1.45 WHIP. Parnell blew the save in last night’s game and picked up the loss. He has a 4.18 ERA on the year with a 1.54 WHIP. But because he can throw the ball 100 mph he gets every chance to perform in key situations. Acosta cannot reach triple-digits with his fastball, but with an average fastball velocity of 94.4 and a K/9 of 9.0 this year, it’s not like Acosta has anything for which to apologize. When he was struggling earlier this season, Acosta allowed 4 HR in his first 7.1 IP. He definitely has some gopher-ball tendencies, but even with that, he still has a better ERA than Parnell. 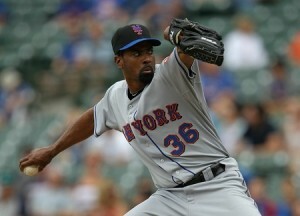 It’s time for Mets fans to embrace Acosta and it’s time for management to make sure he is on the 2012 team. While he did not come up through the farm system like Parnell did (and is four years older, too), Acosta has earned the right to be used regularly in key situations. HAS ANGEL EARNED HIS WINGS? : There has been a lot of speculation that the Mets will look to save money by non-tendering Angel Pagan in the offseason. Mets fans had high hopes for Pagan coming into the season and quite frankly he has not reached expectations. However, in his last 165 PA, Pagan has a .299/.323/.433 line. A .756 OPS would put him comfortably in the middle of the pack among full-time center fielders. But it’s not his offense that may lead to the end of his Mets career. Baseball-Reference shows Pagan with a -0.9 dWAR this year. FanGraphs shows his RZR of .917 as ranking 15th among 20 full-time CF and his -17.8 UZR/150 ranks dead last. The Mets are 47-55 when Pagan starts in CF and are 16-9 when Jason Pridie starts there, despite Pridie’s inferior offensive numbers. It should be pointed out that Pridie’s starts came while the team had Carlos Beltran and Daniel Murphy in the lineup and the Mets were playing their best ball of the season. But that does not take away from the fact that Pagan has had a poor defensive season. Under previous management, Pagan might be a cinch to return in 2012. But under Sandy Alderson, no one should take that for a given. R.A. ROLLS ON: The Mets started R.A. Dickey on short rest Friday night and he responded with a Quality Start and picked up the win. It was the second straight victory for Dickey and the first time all year he had won consecutive decisions, much less back-to-back starts. Wins have been hard to come by for Dickey this season. After a rough beginning of the year, he has a 3.01 ERA in his last 20 starts but is just 6-6 in that span. HOME SWEET HOME? : Of the remaining 25 games in the season, the Mets play 15 home games. For most teams that would be a welcome schedule; however, the 2011 Mets have played better on the road. This year they have a 37-34 road record, tied with the Diamondbacks for the fourth-best away record. But at Citi Field the Mets are 30-36, which ranks 13th in the 16-team NL. Last year the Mets were 47-34 at home and 32-49 on the road. FROM THE ELIAS SPORTS BUREAU: Lucas Duda’s RBI single in the seventh inning snapped a 2–2 tie and plated the decisive run in the Mets’ 3–2 win over the Marlins on Wednesday night. Duda had a .517 batting average from the seventh inning on in August, recording 15 hits in 29 late-inning at-bats and driving in 13 runs. That was the most late-inning RBIs for any major-league player in August and the only major-league player with a higher late-inning batting average in the month (minimum: 25 plate appearances) was Casey Kotchman (16 for 30, .533). Parnell just picked up his 5th save, but what does that really mean? If Izzy was pitching the 9th then he would have 305 or if Acosta was pitching the 9th he would have had his 5th. Why do major league teams only designate one man if they have equal parts? All they are doing is increasing the salary potential of their designated choice. Don’t get me wrong, there are closers out there but not every team has to have one. I’m more in favor of a reliever rotation for the Mets until one earns the title. Relief pitching needs a substantial upgrade for 2012 and I would prefer 3-4 arms at 10M then one closer at 10M especially with money so tight.Tight money also leads to the Pagan dilemna. Nieuwenhuis may not be ready, and Pridie everyday is a downgrade. Normally I would expect them to tender a contract but the tight money may be needed for Jose and relief pitching so I guess Sandy will have to scrape around for a bargain find that is better than Pridie and end up trading Pagan. Yes, there shouldn’t be a “position” (they’re all relievers for god’s sake!) just for a save, but thanks to Dennis Eckersley back in Alderson’s A’s days, we have a closer. I always comment in forums, in MLB Mets Gameday wraps, and other sites like this one. But I always wonder if the Mets management ever even bother to see what the fans think? Of all the ideas thrown around, there’s bound to be one that’s good. I would like to see Acosta next year, but will Alderson see this? What about Collins? My point is, if I became a baseball player, or a manager, or a GM, would I look at the comments about myself (hypothetically) on Mets.com or mets360? Do I even think about the suggestions of SNY shows like Loudmouths or Wheelhouse, or the occasional outcry from Gary Cohen or Keith Hernandez? If they do, the Mets would have surely made better choices. It would surprise me if Alderson didn’t have a flunkie to monitor WFAN and other outlets. Regardless, I’m glad that you decided to comment here and you are welcome any time!